The RM Auctions Amelia Island 2013 auction was held Saturday, March 9th at the Ritz-Carlton Hotel in Amelia Island, Florida, resulting in $26.8 million in total sales and a 92% sell-through rate. 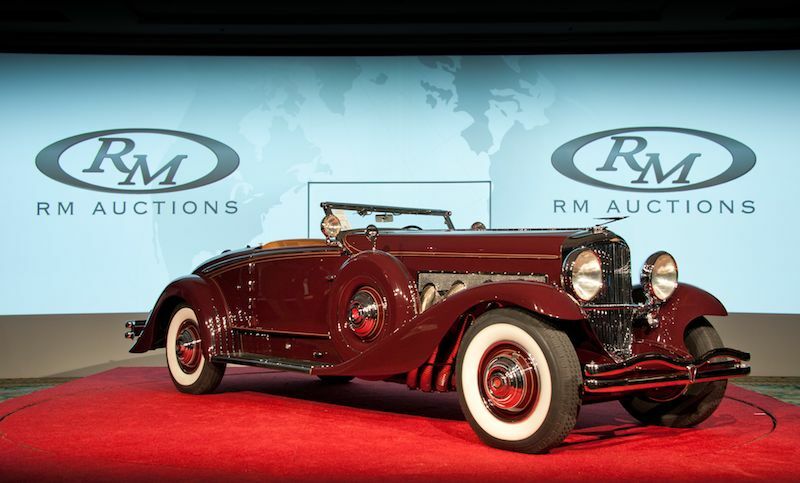 RM gathered more than 85 automobiles for the single-day auction, with the top result of this year’s Amelia Island weekend going to the 1935 Duesenberg Model SJ Walker-LaGrande Convertible Coupe that sold for $4,510,000. Designed by J. Herbert Newport with coachwork by Walker-LaGrande, chassis J-530 is one of only three produced and the only supercharged example. The second highest result was the 1933 Stutz DV32 Convertible Victoria, which attracted bidding in the room and on the phones, eventually selling for $1,512,500. The price was double the car’s pre-sale estimate and a new marque record for a Stutz sold at auction. In addition to the headline Duesenberg and Stutz, other notable results included the matching-numbers 1965 Ferrari 275 GTB, chassis 07751 and having been in single ownership for 37 years, that realized $1,375,000 and the 1952 Ferrari 225 Sport Berlinetta, chassis 0168ED and one of only six made in period, that found a new home for $1,237,500. Wrapping up the list of cars achieving million-dollar-plus results at the 2013 RM Auctions Amelia Island sale was the Brass Era 1911 Lozier Model 51 Seven-Passenger Touring that made $1,100,000, more than double its pre-sale estimate. Further record results included a rare early production 1955 Mercedes-Benz 190SL Roadster, a car restored to the highest standards and boasting a double set of fitted luggage, which garnered a final sales price of $220,000, establishing a new world auction record in the process. The other record-breaking lot was the 1966 Aston Martin DB6 Vantage, also a recipient of a world-class restoration, which achieved $489,500, to equal the highest sum ever paid for a DB6 Vantage at auction. RM Auctions offered 88 automobiles for sale, with 81 finding a new owner, reflecting a 92% sales rate. Total sales volume was $26,854,600, inclusive of buyer’s premiums. The average price per car sold was $331,538. RM continues its 2013 auction season with the presentation of the Don Davis Collection, April 27 in Fort Worth, Texas, closely followed by a return to Lake Como, Italy, May 25 for its biennial sale held during the Concorso d’Eleganza Villa d’Este weekend. For more information, visit rmauctions.com.